John Lloyd Cruz, the notorious Magic Man surprised residents of Barangay 24, Cagayan de Oro City as he graced the second leg of Magic Moments Fun Fair. Jack ‘n Jill definitely made the day by bringing in surprising possibilities with a wave of exciting games, raffle prices and Magic Cracker products for Kagayanons who joined the said event. 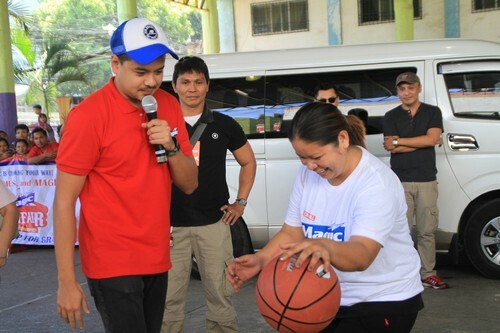 Barangay 24, Cagayan de Oro resident Maricel Visaya impresses John Lloyd Cruz with her dribbling skills during the Magic Fun Fair’s free-throw challenge. Jack ‘n Jill Magic Cracker game booths such as Go Fish Magic Juniors, Spill the Magic Coating, Magic Wheel of Creams and Magic Tic Tac Chips were set for for the enjoyment of the barangay residents. The highlight of the fair is the free throw challenge for Nanays at Tatays. Highest scorers, Maricel Visayas and Alexander Rivera were both declared as winners and were both delighted to meet celebrity ambassador John Lloyd Cruz. He awarded both of them with a surprise Magic Pang-kabuhayan package each worth P25,000.00 each. Magic Crackers through its long-time endorser John Lloyd Cruz awards each top scorers of the free throw challenge top scorers Maricel Visaya and Alexander Rivera, with a Magic Pangkabuhayan Showcase worth P25,000 each. Filipinos can expect more fun and surprises from the Jack ‘n Jill Magic Cracker’s Magic Fun Fair. It is set to bring bigger Magic Moments through carnival-themed events around the country with the help of long-time endorser and a definite crowd fave, John Lloyd Cruz. 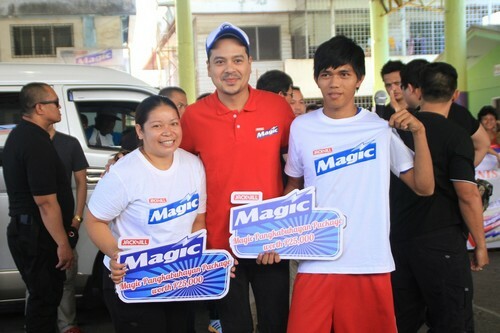 Cagayan de Oro residents were surprised John Lloyd Cruz made a special appearance to award free throw challenge winners Maricel Visaya and Alexander Rivera with Magic Pangkabuhayan Showcase Packages.